Unfortunately, I didn't get the picture of the marquee earlier in the day, when it said "WED - IRISH HORROR FILM". It made me giggle (and also vaguely curious as to whether it was one I'd seen at Fantasia earlier in the year), but at the same time, I wondered if maybe there wasn't something to doing it that way. Because, to be blunt, The Canal was not on my radar, and I suspect that my radar for this sort of thing is better than that of many. 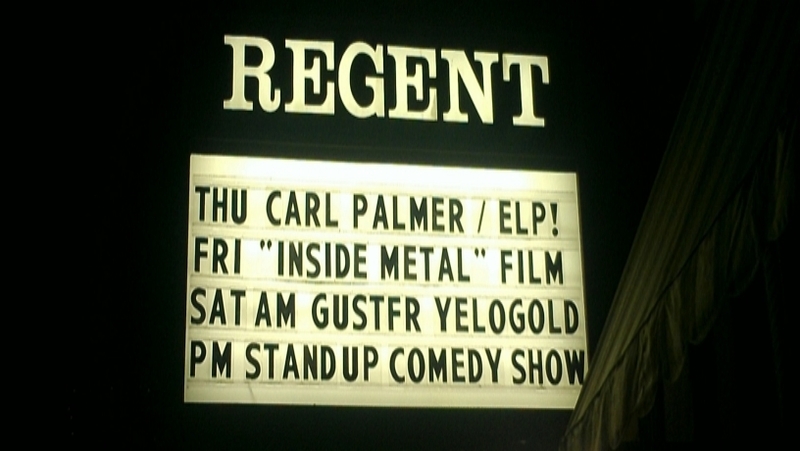 You put that up on the marquee of the Regent, and there is a reasonably good chance that I presume it to be a band. "Irish Horror Film", though? That might get someone in the door. I didn't have it on the "Next Week" list, even though it apparently played on both the 5th and 12th. The first week, it was apparently very much a last-minute booking, with just enough time for the guys at the Regent to get in contact with the Boston Irish Film Festival and have them send something out to their mailing list (which, I gather, brought a decent crowd for the first screening), and the listing apparently just disappearing at the wrong time for me to see it last week. It wound up being me and half a dozen or so other people, although it was just me until awfully close to showtime. I did wonder a bit about booking it for a couple of screenings two towns outside Boston, though. One friend suggested that it might have been contractural - it had to get into a certain number of theaters as part of the sale to the distributor, but I'm not sure a tiny label like Orchard is in a position to promise anything, and doing this kind of minuscule release if they'd implied bigger might not be great for the reputation. My own theory is that, in a weird way, this sort of booking is actually advertising for the video on-demand release. After all, the VOD menu on your cable service or even Amazon (and other services like it) is kind of terrible, a big list of movies that are all close enough in type and quality that they all blur together. So how do you get yours to stand out from the pack? Ads, I suppose, but I half wonder if it isn't cheaper to rent a place like the Regent for a couple nights, let the guys who like going out to the movies enough to comb through those listings find it, pay money, and talk about it later. Heck, I didn't love the thing, and I'm blogging about it, which is more than I've done for the more interesting movies I've found on-demand whilemaking a link to Amazon. Sure, that's the explanation that boosts my ego a bit, but it's still worth a thought, especially combined with that "WED - IRISH HORROR FILM" marquee. There are a lot of movies available to us these days, and sifting through them is almost impossible. Sometimes a generic description is actually more useful than a title (especially when the canal in question is neat, but not important enough for me to make much mention when reviewing the film), and it's quite possible that word-of-mouth these days may be more important for just presenting a film's existence than its goodness. The Canal opens with a bit that's almost too clever for its own good, with film archivist David Williams (Rupert Evans) standing on stage and asking an audience full of unruly children if any want to see some ghosts, finishing the introduction with a sort of "here we go" before the main titles roll. It's an odd thing, because the movie isn't particularly self-referential after that, and while it's nice to see filmmaker Ivan Kavanagh going for honest, relatively undiluted scares, there's a bit of a seems that the movie could use something to grease the rails a bit, and maybe a little more of that could have done it. Soon after that scene, David is moved into a new house with his beautiful wife Alice (Hannah Hoekstra) and, eventually, their son Billy (Calum Heath). He seems to enjoy his work, at least until one bit of film from 1902 crosses his desk. It's from the police archive, and shows scenes from the investigation of a grisly murder that happened at his house. That's unsettling under any circumstances, and just not a good thing to have running through one's head when ones five-year-old soon is hearing noises at night and one's wife is probably having an affair with a wealthy client. Every once in a while I get the itch to try and write a screenplay, but the middle part scares me off. I'm not saying that clever set-ups or thrilling climaxes come easy, but they seem more likely to be the product of inspiration than what connects them, which seems more obviously like hard work for the filmmaker and can, if he or she is not careful, seem that way to the audience. Kavanagh sometimes seems to struggle with this with The Canal; it runs around in circles as David points cameras at prospective ghosts a lot or panics and sends his son and the nanny (Kelly Byrne) back and forth based on where the last thing to freak him out was. As in a lot of horror movies, elements can seem somewhat randomly thrown together rather than supporting a central idea.